Hello Guys! This is my tutorial number 7 on HTML. If you would like to read the previous 6 tutorials then please use the search box above, type HTML and get the HTML tutorials list. Today I will discuss about a simple topic of HTML. Really this is as simple as I say! :) Okay let's start. Practice rules are as usual. Use notepad and a web browser. Save the file with .htm or .html extension. 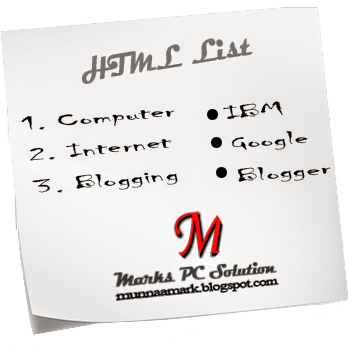 There are mainly two types of lists can be created by HTML code. The first one is ordered list and the other is unordered list. In an ordered list, the list items are marked by numbers. This exactly looks like a numbered list created by Microsoft Word or other text editing programs. Remember, o indicates unordered (o) and l indicates list. Thus it is written as <ol>. There is another list in HTML which is known as description list. A description list contains a brief description of the list item. But I think you can describe the list item simply typing some texts. This is not very important to create a different type of list to describe list items. That's why I'm not showing the code of description list. Tip: You can use line breaks, text, links or images inside a list item. <dd> - Defines a description of a term/ name in description list.